Why do YouTubers Hate Journalists, and Should Publishers Pay Their Sources? Isn't that amazing? We are now only two years away from the year 2020, which to me (being a sci-fi fan) is insane. The movie Time Cop about time travel was set in 2004. The Bicentennial Man with autonomous robots was set in 2005. Back to the Future II was set in 2015. Terminator Salvation was set in 2018. And, even though we still don't have time machines, flying cars or fully autonomous robot butlers, there are many very good things to look forward to. Just before Christmas, as you know, I published 'The Media Trends to Care about in 2018-2023'. If you haven't had time to read this yet, I highly recommend that you do, because it sums up a lot of the things you should focus on in 2018. This 41-page Plus article will give you a big picture overview of all the essential things that publishers need to consider if they want to create growth online. In it, I'm talking about 3 key topics. Slow-growth (which is much more important than what most think), fast-growth and growth tactics. Secondly, we also need to start off 2018 with a bit of a wake up call. Specifically about how journalists are talking about and covering YouTube. This article is based on a Twitter discussion that got a lot of attention just before New Years, when a journalist was outraged when YouTubers asked to get paid for their time. From a traditional media perspective, I can understand why journalists react with disgust about this, but it also illustrates a problem with how traditional media looks at YouTubers. So, in this article, I'm going to illustrate why YouTubers react the way they do. What else is worth looking at? Well, Parse.ly published an article highlighting the biggest trends of 2017, with data. It's a very good summary of some of the key trends. 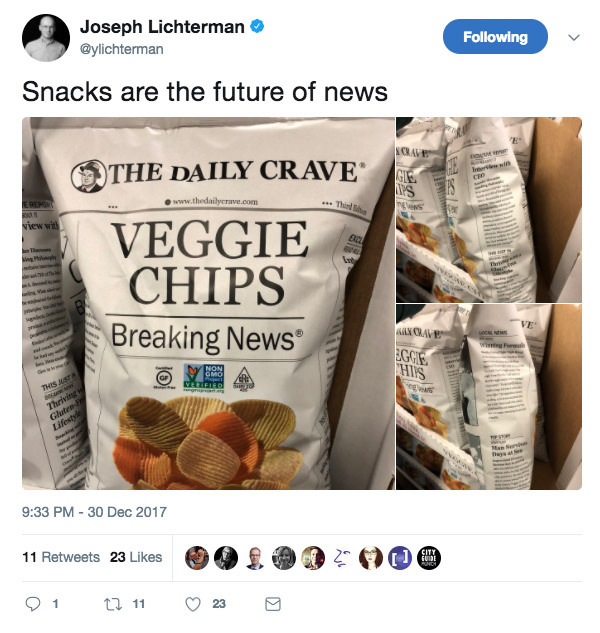 And finally, for those of you who might still be suffering from hangovers, Joseph Lichterman came across 'the future of snackable news' ... quite literally. So, welcome again to 2018!